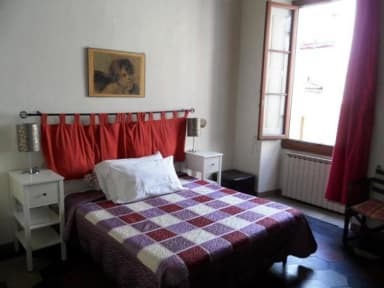 Bed & Breakfast D. Alighieri i Firenze, Italien: Reservér nu! A medieval Tower that joins an old mansion in Republic Square welcomes and accompanies your stay in town. (The Bed&B is located on the 6th floor reached by a lift). the Uffizi and so on. Just got out, every itinerary will give you up completely to Florentine soul and to all the beauties in the town of Florence. Glancing at a lane, coming to a square, walking the Lungarni will give you a great joy. Shopping is possible in the most tasteful shops, the most characteristic markets; pleasure in the most famous restaurants, cafés, the typical taverns, wine-shops, the most amusing pubs, the most intriguing discos in the town. You can reach all these places in a few minutes on foot. Besides, every requirements of moving out of the centre to make an excursion on the outskirts of Florence and other interesting places in Tuscany will be fulfilled by the numerous trips of bus and coach-lines that have stops near the Bed and Breakfast 'Alighieri'. The manager will offer to you with cordiality, availability and moderation, its services and you'll spend your staying in Florence wonderfully.